Can Rats Feel Empathy For Each Other? As the go-to animal for biological and behavioral research, rats have long been the darlings of science. But only in recent years has their capacity for empathy started to get more attention. Later, in 1964, Rice conducted another rat empathy experiment2 in which he placed pairs of rats within view of each other. One animal was shocked, and the other was not. Rice expected the observer (unshocked) rats to respond to the sight of the other rat’s pain by quickly pressing on a bar that they had learned would stop the shocking. Instead, the observer rats retreated to the corner of their box, showing a heightened state of fear. This response also occurred in rats that were untrained and had never experienced the pain of shocks. Even though the rats did not react altruistically, it was still clear that their emotional states were influenced by that of the shocked rats they observed. They demonstrated a tendency for emotional contagion. In more recent studies, this emotional influence has been examined more closely. A 2008 experiment3 by Jeff Gavel studied rats’ fear responses when they were paired with other rats of similar and different conditioning. Some rats were trained to fear a chamber through electric shock, other rats were untrained and unshocked. Members of the fear group developed strong fear responses (a rise in the levels of prolactin, a stress hormone) when presented with the chamber, while those of the unshocked group showed little to no fear. Subsequently, pairs of rats were taken from each group and were confronted with the chamber together. If the pair was made up of rats that both learned to fear the chamber, they demonstrated even greater fear than if they were alone. It seemed that for fearful rats, seeing another’s fear only increased their distress. Finally, Gavel took single individuals from both groups and put them together. By pairing rats from the two different groups, Gavel expected that unshocked rats would start to show increased stress because they could see the stressed behavior of their fearful partners. But how could he be sure that empathy would be the cause of the stress increase, rather than simple emotional contagion? “Cognitive empathy can only occur if one rat’s prior experience facilitates cognitive understanding of [another rat’s] situation. In our first experiment, cognitive understanding was not facilitated in the subject rats. While the subject rats were exposed to the stress behaviors of the [other rats], they never had any prior experience with the source of that stress, shock, and only experienced the shock chamber as a “safe” place. In order to have an empathetic response, subjects must have prior experience with the shock chamber. They also must be able to observe the [other rat] being shocked.” wrote Gavel. Gavel went on to revise his experiment methods, enabling rats to get the first-hand experience necessary to relate to other rats who feared the shock chamber. This was the first step to enabling an empathic response. A group of rats were exposed to the shock chamber themselves, then were allowed to observe another rat in the shock chamber through their own translucent home cages. Surprisingly, these “empathic” rats actually showed lower stress responses than rats of other groups. “It is my speculation that the reason why the empathetic animals’ stress levels came out lowest of the three groups was because they initially had a stress response but that cognitive understanding buffered that stress, allowing it to abate.” said Gavel. He also concluded that keeping the rats in their home cages during testing may have had an effect on the results. Because the rats had come to understand that their home cages were safe places, they could also understand that what they saw happening to the other rat in the shock chamber wouldn’t happen to them at that moment. Overall, the rats’ prior experiences gave them the comprehension necessary to maintain relatively low stress levels. More recent studies have gone back to examining how rats respond when given the power to alleviate the suffering of another, like the Rice experiments of the 60’s. In 2011, rats were tested4 by placing them in a cage containing a small plastic tube. Within this tube, a captive rat was held. A door at the front of the tube could be opened by the free rat of its own volition. The free rats would quickly figure out how to open the door and release the trapped rat. They did so even when they could have no contact with the trapped rat once it was released. If there was no rat in the tube, they would rarely open it. The scientists decided to expand upon the initial experiment, adding another tube containing chocolate treats to the cage, alongside the tube with a trapped rat. When the free rat was presented with these new conditions, it still acted in a pro-social manner. The free rat would open the doors to both tubes, and much of the time they would even share some of the chocolate with the released rat. In order to take action in this experiment, the rats would have needed to keep calm despite the distressing nature of the situation. Each of the female rats learned to open the tube door and release the captive rat, but nearly a quarter of the male rats never did. “I don’t think it’s because they didn’t have empathy. I don’t think they had the ability to down-regulate their own stress and act on the empathy.” Mason said. In another study6 , it was discovered that rats have some biases when it comes to who the will and won’t help. If a rat had only been raised among its own strain of rats (white), and they were tested with a spotted rat as the captive, the free rat would not open the door. What’s especially interesting is that when white rats are raised exclusively among members of the other spotted strain, they will not help other white rats during the tube experiments. The rats’ pro-social behavior is dependent upon its familiarity with its own and other strains. A rat’s prior environment and experiences has bearing on how it relates to others. Even more recent research8 conducted at the Kwansei Gakuin University in Japan makes an especially strong case for rat empathy. 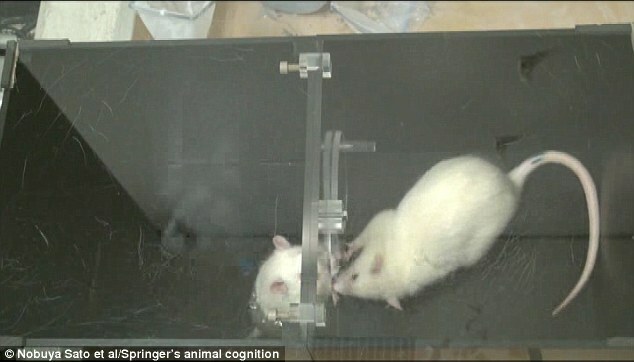 Scientists set up a series of experiments to observe how rats responded when another was immersed in water. One rat would be placed in a translucent, dry cage. Joined to this cage by a latched door was another cage that would start to fill up with water. The rat trapped in this cage showed great distress as the water rose. The dry rat would soon learn how to open the door and allow the soaked rat to find refuge in the dry cage. It was found that the rats would not open the door when there was no water in the other cage containing a rat, showing that their help-response was based on the other rat’s distress. Also, rats who had previous experience being soaked in water learned how to open the doors more quickly. This suggests that the rats were more motivated to help based on their empathy and understanding of the other rat’s discomfort. A final experiment showed that even when rats have the option of accessing treats rather than saving the wet rat, they will choose to help most of the time. In light of the aforementioned studies, there have been those who are critical of the findings. Some say that rats may be rescuing others not because they have empathy, but because they have some self-motivated interest. Critics have disputed whether or not the responses of the rats in the 1962 experiment were born of altruism or of self-service.9 They posited that the experimenter rat may have freed the distressed rat in order to put a stop to its “annoying” squeaks. 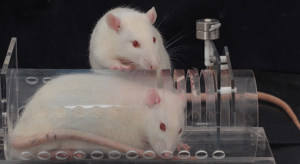 Others apply similar criticism to the more recent tests, claiming that the rats sought to decrease the stress they felt by observing others in pain or discomfort. If that were the case, it does not preclude empathy. The fact that the rats are able to feel stress in response to the discomfort of others points to empathy in and of itself. How and why the animals act upon their empathy is a separate matter. Others claim that the rats are releasing the trapped rats because they have a desire for social contact. However, a number of the studies included alternate experiments that test this theory. Rats still showed altruistic behaviors even when they were not able to have any social contact with the other rats after release. In the case of saving soaked neighbors, they would not open the door if the other cage was dry. They only gave the other rat access to their cage when the other cage was being filled with water. When tested, rats generally do not exhibit helping behaviors simply out of a desire for contact. While these experiments may not be pleasant for the rats to participate in, they do provide important insights into the emotional lives of rats. With this new understanding, strides can be made toward better accommodating the comfort and well-being of rats and other animals. To learn more about rat empathy and some of the research covered in this article, watch the video below. 4 – Inbal Ben-Ami Bartal, et al. 6 – Inbal Ben-Ami Bartal, et al. 8 – Nobuya Sato, et al. Altruism or Arousal in the Rat? 10 – Alan Silberberg, et al.